December 2, 2018 By Eugene Nielsen & filed under All Articles, Edged Weapons, Gear. SOG Specialty Knives & Tools was founded in 1986 by designer and toolmaker Spencer Frazer. Named after the elite Vietnam-era Special Forces military group known as the Studies and Observation Group, the company’s first knife was a replica of the original SOG Bowie knife. The SOG Strat Ops Auto is an impressive recent addition to the company’s now extensive line. There are numerous scenarios when the ability to quickly deploy a knife with one hand may be a lifesaver. While nothing can beat a fixed blade for speed and ease of deployment, it lacks the compactness and convenience of a folder. Why go with an auto opener in this day of assisted openers, flippers, and other one-handed opening methods? Although other opening methods can be equally fast, auto openers need only minimal movements to open, making them well suited for tight spots or with thick gloves. There’s also less chance of fumbling. Strat Ops Auto from SOG is a U.S.-made automatic-opening folder with premium CPM-S35VN stainless-steel blade housed in a linen Micarta handle. It was designed as a backup and go-to tool for military and law enforcement personnel. The Strat Ops is a premium USA-made heavy-duty auto-opening knife. It has a thin profile and pocket-friendly design that make it a great choice for discreet everyday carry. It’s a relatively lightweight 3.7 ounces. The knife features a 3.5-inch CPM-S35VN stainless-steel drop-point blade. The blade is 0.11-inch thick and is saber-ground with a plain edge and slight recurve. Blade hardness is 59-60 HRC. CPM-S35VN is a top-grade stainless steel. Made in the USA by Crucible Industries, it’s a tougher version of the popular CPM-S30V, due to the addition of 0.5% niobium. It offers what many consider the best combination of toughness, wear resistance, and corrosion resistance. It offers improved edge retention and better resistance to chipping while maintaining ease of sharpening. The heat treatment is as important as the steel. SOG utilizes a unique computer-controlled cryogenic heat treatment process that maximizes the performance of the blade. SOG went with a drop-point blade on the Strat Ops. It’s a great choice for a duty blade. On a drop-point, the spine of the blade continues forward to the tip, thus providing a stronger tip. The lowered point is in alignment with the center axis of the knife, providing added control and eliminating any pitch when thrusting. Strat Ops is perfectly sized for discreet everyday carry and is relatively lightweight. The blade has a plain edge with a slight recurve. The recurve adds length to the edge without adding length to the blade. It also places the edge at multiple angles to the object being cut in any given cutting motion, increasing the cutting effectiveness during draw cuts. Resharpening is easy, although the recurve does require a slightly different technique. The Strat Ops came razor-sharp out of the box. The knife has held its edge exceptionally well throughout my testing. This isn’t surprising, given the CPM-S35VN blade and SOG’s highly regarded proprietary cryogenic heat treatment. The blade has a non-reflective black-matte Cerakote® coating. Cerakote is a high-performance thin-film polymer-ceramic composite coating. It’s tough, durable, and provides additional corrosion resistance, abrasion resistance, and lubricity. 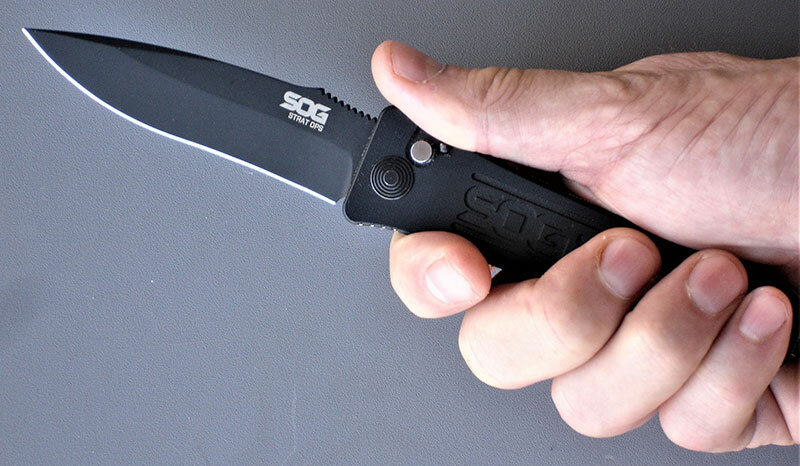 SOG utilizes black linen Micarta® for the scales and stainless steel for the liners. Linen Micarta is a composite made by applying heat and pressure to layers of linen fabric impregnated with synthetic resin. It’s tough, durable, light, and looks great. SOG opted for smooth scales that won’t abrade or catch on clothing. The scales are attached to the liners with stainless-steel button-head Torx® screws. The corners of the handle are rounded and the edges of the scales are chamfered for comfort. The SOG logo and four longitudinal grooves are milled into the scales to provide the needed purchase for a secure, confident grip. The handle measures 4.4 inches in length and is a trim 0.41-inch thick. The front of the handle flares out and has jimping for additional purchase and control. The thumb ramp on the blade also has jimping. The handle has a lanyard hole. Strat Ops has a reversible low-carry pocket clip for tip-up carry. Knife disappears in a pocket. Only clip is visible. The pocket clip is reversible and mounted for tip-up carry. It’s stainless steel and has a black finish. 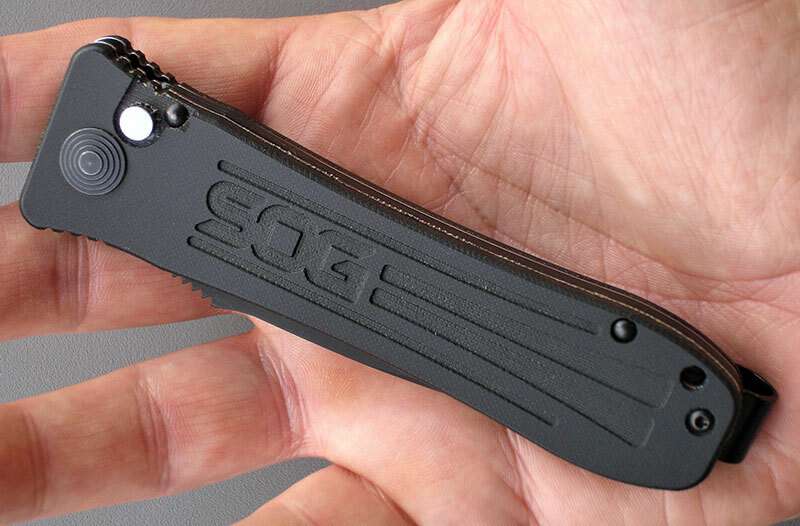 The clip is skeletonized with the SOG logo. The Strat Ops literally disappears in the pocket, with only the clip showing. The knife employs a plunge lock actuation system. It’s strong and reliable. The push-button extends slightly above the scales, enabling the user to easily locate it by feel. The button must be depressed into a recess in the scales to release the blade. The plunge lock is augmented by a positive slide safety that prevents accidental opening or closing. The safety is perfectly positioned on the scales across from the plunge-lock button for easy operation. Blade deployment is lightning fast. The knife has a strong coil spring that provides more torque than the coil springs on most auto openers. The knife feels like it wants to jump out of your hand. Lockup is solid with no blade play. Strat Ops has outstanding ergonomics. Handle accommodates forward and reverse grips equally well. It provides great control and a secure grip. The knife is exceptionally well-balanced and has outstanding ergonomics. I have average-size hands and found it to be darn near perfect. I really couldn’t find anything I would change. The handle accommodates forward and reverse grips equally well. It provides great control and a secure grip. I am very impressed with the SOG Strat Ops. It’s an outstanding knife. I doubt you can find a better auto-opening folder for discreet EDC. Design, materials, and workmanship are absolutely top-notch. The Strat Ops has a suggested retail price of $254.00. 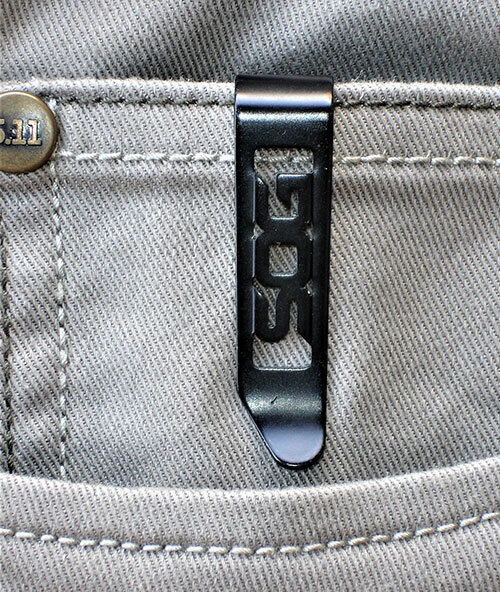 All SOG products come with a lifetime limited warranty. Engraving of text or logo/graphic is available at additional cost. SOG Knives & Tools is a GSA Contractor (GSA Contract Number GS-06F-0013J).